Brooklyn,L.I. Friday eve.last by Rev Mr Woodhull, Joseph Henshaw of Boston to Grace Augusta Sands dau of Joshua. 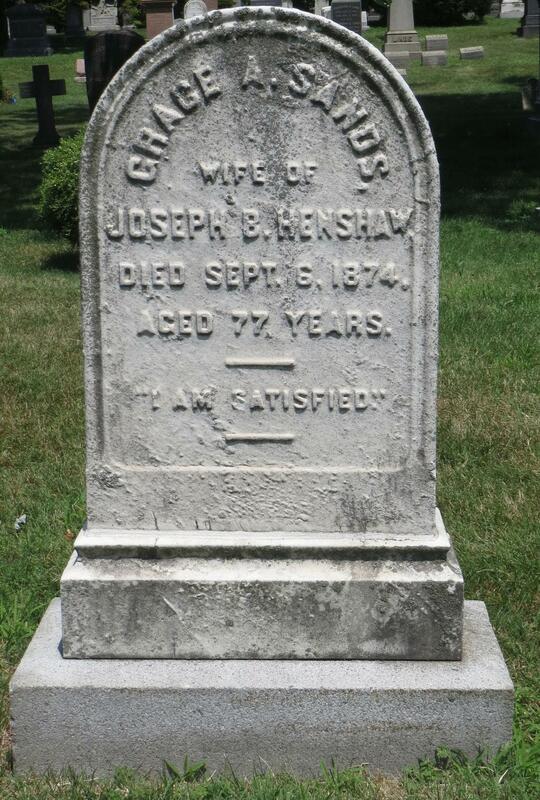 Henshaw, Joseph B.,merchant of Boston,m.Grace A. Sands,daughter of Joshua Sands Esq.,in Brooklyn,N.Y. Charles J. Henshaw, age 62 [unclear], born in Connecticut; farmer; $12,000 real estate; $5,000 personal property. Cornelia Henshaw, age 47, born in New York. Cornelia M. Henshaw, age 23, born in New York. Marcella M[..unclear], age 35, born in Ireland; cook. Mary Martin, age 30, born in Ireland; nurse. Wm N. Forster, age 15, born in Nova Scotia; servant. Michael Morrisey, age 35, born in Ireland. Peter Stilburg, age 20, born in Germany. Ellen D. Henshaw, age 27, born in New York. Joseph Henshaw, age 75, born in Connecticut; merchant. Grace Henshaw, wife, age 68, born in New York City; 7 children. Emily Henshaw, child, age 46, born in Massachusetts; married, 1 child. Josephine Henshaw, child, age 42, born in Massachusetts; married, 2 children. Edward Henshaw, child, age 44, born in Massachusetts; single. Hayward Henshaw, child, age 37, born in New York City; single. Joshua Henshaw, child, age 35, born in Kings County; single. Ellen Henshaw, child, age 31, born in Kings County; single. Cornelia Henshaw, child, age 27, born in Kings County; married, 1 child. Joseph died intestate (without a will). His estate was administered in the Kings County [New York] Surrogate's Court on Feb 6 197115 (see scan below). Grace died Sep 6 187412,13,17 [Apr 6 187418], Brooklyn, Kings County, New York12,13,17; buried Sep 8 1874, Section D Lot 19785, Green-Wood Cemetery, 500 25th Street, Brooklyn, New York12,13,17. See also: Linus K. Henshaw who was also living in Brooklyn, New York in 1829.
privately printed, New York, 1949; compiled by Malcom Sands Wilson. 1865 New York state census, Brooklyn, Kings County, New York; Ward 3, page 26, line #18, family #175. Henshaw genealogical chart, author unknown; Contributed by Donald Craig Henshaw. 1865 New York state census, Brooklyn, King County, New York; Ward 3, page 26, line #18, family #175. Ancestry Family Tree data posted by "alkerr22". Halbert's "The New World Book of Henshaws" (for what it's worth). GEDCOM file H7290 at http://www.ancestry.com. New York, Marriage Newspaper Extracts, 1801-1880 (Barber Collection); http://www.ancestry.com. U.S., Newspaper Extractions from the Northeast, 1704-1930; http://www.ancestry.com. "U.K. and U.S. Directories, 1680-1830"; http://www.ancestry.com. 1860 census, Pound Ridge P.O., Mamaroneck Township, Westchester County, New York; page 325, line #8, dwelling #2160, family #2432. New York, Death Newspaper Extracts, 1801-1890 (Barber Collection); http://www.ancestry.com. 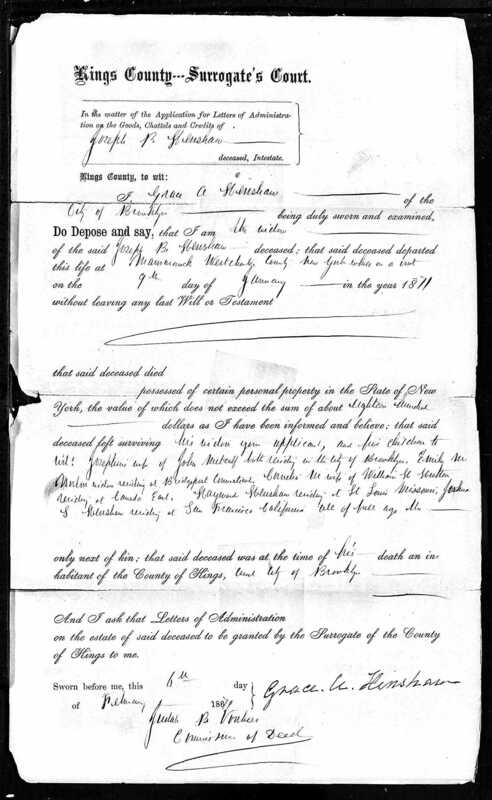 New York, Wills and Probate Records, 1659-1999; http://www.ancestry.com. U.S. City Directories, 1822-1995; http://www.ancestry.com. 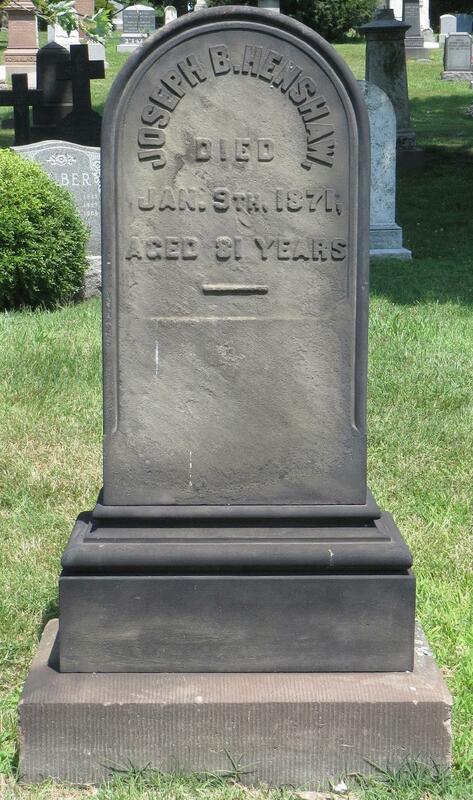 New York, New York, Death Index, 1862-1948; http://www.ancestry.com.